If you haven't seen this film and have NO IDEA about the plot twist, do not watch the clip. It's a classic film, yes and if you're even semi-film literate, you would probably know the twist without having seen it but still, it will have a bit more impact if you don't know. But this is a dark twisty neo-noir with combines the classic motifs of a film noir with more shocking and modern content. This film is often cited as one of the best screenplays ever written but its shocking ending was not concocted by the Oscar-winning screenwriter Robert Towne (who stormed off the set before the script was finalized) but rather Roman Polanski with some suggestions by Jack Nicholson. I wouldn't be a proper Filipino cinephile if I didn't write about the passing of actor, writer and director Mario O'Hara. He was 68. He suffered from leukemia. He has been a major figure in Philippine cinema having written, directed and even acted in some of our classic films. I've already listed Three Godless Years as among my favorite Filipino films and it's also one of the best World War II movies ever made. He also gives a remarkable performance in the Filipino classic Weighed But Found Wanting. I need to see more of his work but most of them are tough to find. This is a huge loss for Filipino and even WORLD cinema. It's time more people know about his work. RIP, direk Mario. The Death of Mr. Lazarescu (Cristi Puiu) ***1/2 - After reading what this movie is about, I was surprised that it's supposed to be a black comedy. And it is, in a way, since it at times get absurd and ridiculous (in a good way). An elderly man calls an ambulance and deteriorates as he gets passed from one hospital to another. What's great about this movie is that you sympathize with Mr. Lazarescu yet also at the same time you can sort of understand why the doctors and nurses are pissed off at him. It didn't blow me away but it is a well-done satire on hospital bureaucracy in Romania. Die Nibelungen Part 1: Siegfried (Fritz Lang) ***1/2 - This is one Fritz Lang's lesser known works. It's part one of a two-part silent fantasy epic. This one is about a young man (the Siegfried of the title) who makes his way into a royal family through a series of fantastical adventures. As with lots of Fritz Lang's films, the film contains some impeccable visuals and special effects (with the exception of an obviously fake-looking dragon). Though it occasionally drags, the story is often compelling. This is a set-up to what seems to be an even better film. The film version of Harper Lee's classic novel is also a classic film. This scene is probably the reason why Gregory Peck is considered one of the best film actors of all time. It's an electrifying, impassioned speech which makes doubly frustrating that the all-white male jury still came up with that verdict in a subsequent scene. I do think this speech played a little role in the civil rights movement, even just a little bit. This animated short is directed by animation master Chuck Jones. It's only a little over 7 minutes long but it is considered one of the greatest pieces of animation ever. It's a very simple story about a tough-looking bulldog named Marc Anthony whose heart is softened by the cute and adorable kitten named Pussyfoot. When watching this film, look at the facial expressions of Marc Anthony, the animation is able to convey emotion and character in just a few seconds far better than words. This piece of animation has shown its influence in such diverse films as Gremlins and Monsters Inc. Under the Roofs of Paris (Rene Clair) **** - This is my first Rene Clair film and it is a magnificent one. It's a film about a love triangle between a young woman, a street singer and a gangster. It's funny, thrilling, moving and goes into unexpected directions. This was made in 1930 and it's one of the early sound films with some scenes playing out kind of like a silent movie. It also features some highly inventive use of sound and music. The ending is a bit unexpected but very satisfying nevertheless. Rock of Ages (Adam Shankman) ** - People who know me know I just love, love, love, love musicals. Indeed, for me, there's nothing quite like a spectacularly choreographed song-and-dance number in the middle of a film. There are few things better than a great musical. This is not one of them. This is jukebox musical on '80s rock songs with a generic plot. Now, a jukebox musical can be great (I mean, Singin' in the Rain is a jukebox musical) if the staging and performance is fresh and imaginative and a cliched, generic plot can be easily overcome by wit, charm and great performances. This movie barely did any of these. It is almost devoid of charm Tom Cruise gives an interesting performance but not enough to completely save it. What another "Great Scenes" post? Well, the lead character of this film, Henry Hill, passed away this week at 69 years of age. I feel that it's appropriate to commemorate that by presenting one of the highlights of Martin Scorsese's great film about the mob, Goodfellas. In this scene, Henry takes his girlfriend into the Copacabana club through a secret entrance. This is done by one single tracking shot. More than just a gimmick, the tracking shot is also symbolical of just how fast this type of life seduces you. It's June 12th and it's actually Independence Day in the Philippines, my home country. What better way to celebrate it than to write about one of my favorite all-time Filipino films, the wildly inventive musical-comedy from visionary director Mike de Leon, Kakabakaba Ka Ba? The film is basically about four friends who pretty much go through a weird, musical journey after a double date. It culminates in this scene involving a Japanese takeover of the Philippines via brain-washing through laced communion wafers. Crazy? Yes. Awesome? You betcha. I apologize for the lack of subtitles. I hope a proper DVD release will be in order for this Filipino classic. Once Upon a Time in China II (Tsui Hark) ***1/2 - The second film in the Once Upon a Time in China series follows the further exploits of historical figure Wong Fei-hung. This time around, he's battling a religious terrorists hellbent on driving foreigners out of China while at the same time helping out democratic revolutionaries. Someone says this is the best of the series. I don't know about that but it is about as great as the original. The action scenes are truly something to see. They're often more exciting than most modern day action sequences these days. The action and drama is punctuated by humor. It's terrific, fun entertainment. Prometheus (Ridley Scott) *** - Director Ridley Scott is responsible for two films considered to be among the greatest science-fiction films ever made, Alien and Blade Runner. His record since then has been spotty, to say the least and even his good films don't quite match up with those two revered classics. He returns to the Alien-verse somewhat with this sorta-kinda prequel to the Alien-saga, almost as if to prove that he still has it. He's only partially right. This doesn't quite measure up to the first Alien film but it's as a standalone film, it's still a very good piece of sci-fi, the type we seldom see these days where everything has to be action-packed and PG-13 so that alone makes it seem fresh. Director David Cronenberg continues his fascinating streak of quiet genre films with this entry into his oeuvre. 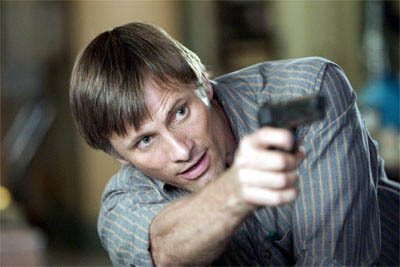 Viggo Mortensen plays a quiet, average family man with a dark, mysterious past that finally catches up with him. The film tells its story quite slowly and methodically with shocking explosions of violence interspersed throughout. Mortensen is outstanding. I have already mentioned in the post below that I love the Wallace and Gromit series by Aardman and Nick Park. The other films are all around half an hour or less long. This is their first feature-length film and it's a great one. Dubbed by its makers as the first ever "vegetarian" horror film, it's about a mutated giant rabbit (the were-rabbit of the title) eating the town's vegetables, threatening their annual Giant Vegetable competition. Following their artistic triumph with The Son, the Brothers Dardenne followed it up with another quiet, thought-provoking drama called L'Enfant ("The Child" in French, a double-meaning title if you watch the film). It's about a young couple who has a baby and involve themselves in a baby-selling scheme with complications of course. This is George Clooney's second directorial effort after Confessions of a Dangerous Mind and it's an even bigger triumph than that film. This one is about journalist Edward R. Murrow (played brilliantly by Oscar-nominated David Strathairn) and his taking on the McCarthy House of Un-American Activities witch hunt hearings. Unapologetically liberal to be sure but you can't deny that it's extremely well-acted and well-crafted. This film is about divorce in the context of an artsy, Bohemian family during the 1970's. It is both wickedly funny and also abrasive and kind of dark and sad. One thing that I appreciate about this film is that it makes no effort to create sympathetic characters but are so complex that you can't help but keep watching. I have written about this film at least twice before. For those of you who have missed them, let me give you the gist. This is a Filipino film and one of the biggest, most famous films from the digital New Wave of Filipino films that emerged during the 00's. It's about a 12 year old gay boy from a family of petty thieves who falls in love with a rookie policeman. It's a sweet, funny but heart-breaking film and one of the best of the year. This is documentary from German auteur Werner Herzog that chronicles the life of Tim Treadwell, a man who has a love and some say obsession with bears and constantly camps and documents them and speaking for their welfare. This eventually leads to his and his girlfriend's deaths in the hands of a grizzly. The film is largely made up of footage shot by the man himself where you see him rant and talk about bears. It's not just nature documentary, it's also a fascinating character study. When this film was surprisingly beaten by Crash at the 2005 Academy Awards, charges of homophobia within the Academy rang loudly for a good few weeks and for good reason. It was controversial when it first came out and became a pretty huge box-office hit and one of the first truly successful and mainstream films that tackle gay love in a straightforward manner. The quartet of young actors: Heath Ledger, Jake Gyllenhaal, Michelle Williams and Anne Hathaway all give amazing performances. I've said it once and I'll say it again: This is film, though not my favorite LGBT-film, did make the world a less homophobic place. The Disney animated feature Pocahontas may have been more a straightforward narrative but this one is kind of more historically accurate portrayal of the relationship of John Smith and Pocahontas. Like with all of Terrence Malick's works, this film is slow, hypnotic, beautiful and mesmerizing. It's definitely not for everyone. Q'Orianka Kilcher is a genuine discovery as Pocahontas. After I saw this film, I kept on thinking about it for days on end, pondering and debating it online for all its hidden secrets, riddles and ambiguities. It is a cinematic triumph of a mystery thriller which give its audience no easy answers. It's basically about an upper-middle-class French family who begin to receive a series of videotapes which simply contains hours and hours of footage of their house. That's all I'm gonna say. There is an uneasy tension throughout the film despite its slow pace with many, many layers underneath. It eschews any form of conventional resolution which I believe elevates it to one of the best cinematic achievements of the new century. Runner-Up: Mysterious Skin (Gregg Araki); Pride and Prejudice (Joe Wright); Munich (Steven Spielberg); The 40 Year Old Virgin (Judd Apatow); Charlie and the Chocolate Factory (Tim Burton). This sort of intersects my two recurring features on my blog, The Great Scenes and The Great Films, because this is basically an entire film but it's also basically ONE big, great scene. It's a film composed entirely one single tracking shot. If you know anything about films at all, this is a pretty difficult, ballsy thing to do because one mistake can ruin the entire thing. It's pretty ambitious too since the film basically covers big highlights of Russian history and is shot in a huge museum. After watching this film, I immediately watched it again and turned on the commentary to find out what it was like to make it. Some people have said that it's just a gimmick but even if you think it's just a gimmick, it still does not take away that it is an impressive achievement. Snow White and the Huntsman (Rupert Sanders) **1/2 - First things first, this is DEFINITELY better than the other Snow White movie this year Mirror, Mirror. This version gives a darker, more feminist take on the Grimm Brothers fairy tale. On the positive side, there are some really cool visuals and effects and Charlize Theron is a pretty awesome Evil Queen. She humanizes her and makes her scary. On the debit side, I'm sorry but Kristen Stewart is a rather poor Snow White. I don't know if I'm being fair to her performance or my views are colored by my distaste for Stewart's celebrity and public persona but I simply cannot buy her as this beautiful, inspirational, radiant, strong and pure-hearted character she's supposed to be playing. Add to that the rather abrupt, disappointing climax and an attempt to throw in a Twilight-esque love triangle in there, this qualifies as a disappointment. Which is too bad because it could've been a really awesome movie with just a recast and one script tweak.